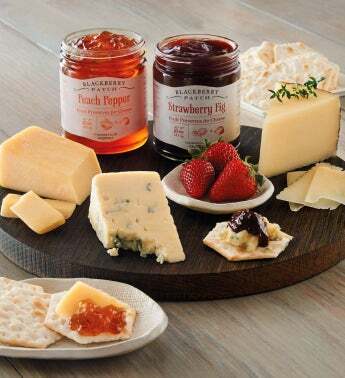 It's easy to offer a delectable spread of appetizers with this curated assortment of artisan cheese and fruit topping pairings. Each cheese is carefully matched with a delicious topping to create a gourmet taste sensation; the Spanish Manchego and Rogue Creamery® Oregon Blue pair with the strawberry fig topper, and the Sartori® BellaVitano® Gold pairs with the peach pepper topper. We've even included the crackers to hold these perfect pairings. This collection makes a marvelous hostess gift, or you can bring it along for your next picnic.